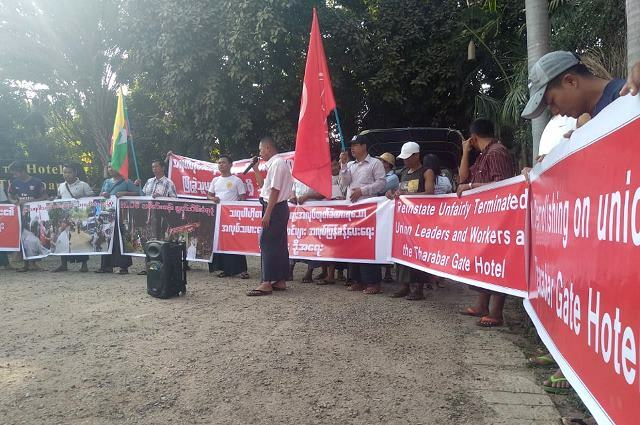 The targeted dismissal of union leaders and members, the brutal destruction of the workers' solidarity camp and arrests of protest marchers have not deterred workers at the Hotel Tharabar Gate from taking public action to demand their rights. On February 10, the union held a rally in front of the hotel to demand the reinstatement of dismissed union members and leaders and full respect for trade union rights at the hotel. The government authorities have taken no meaningful action to facilitate the reinstatement of the union leaders and members who were dismissed in August 2018, prompting the IUF to launch a formal complaint against the government in December with the ILO's Committee on Freedom of Association. If you have not yet had a chance to do so, please CLICK HERE to send a message to management of the Hotel Tharabar Gate demanding the reinstatement of the unfairly dismissed union members, full respect and recognition of union rights and good faith negotiations with the union.